1. How is AI enabling healthcare industry players in transforming the way they do business? 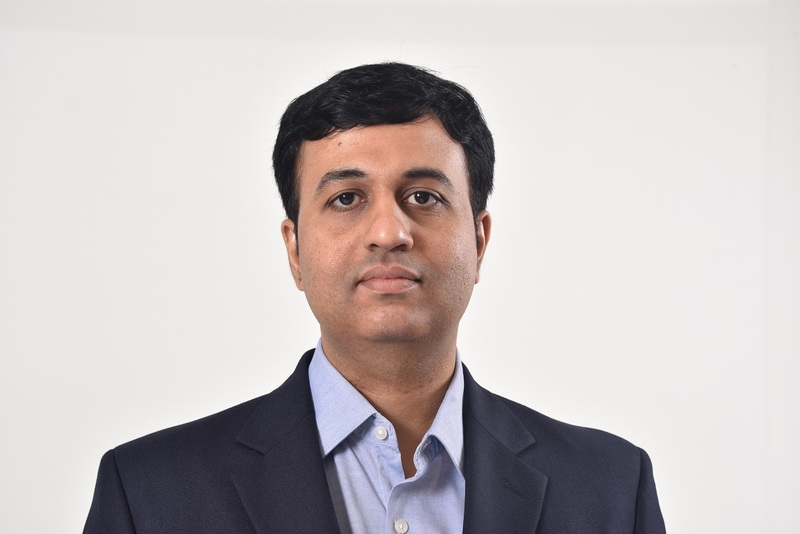 Deepak: AI applications in the Indian pharma industry has definitely not caught up as much as it has in some other industries like e-commerce or Financial services. With AI there is always a need for scale (as scale allows learning to happen faster) and most of the attempts have hence been consumer or patient facing. In the developed world we do hear about large scale solutions in imaging and diagnosis, in clinical trials and in pipeline success measurement. Specifically, within Abbott we have identified a few focus areas namely forecasting, decision tree applications like attrition prediction, robotic process automation in internal data management processes and in delivering superlative user experience for the salesforce through Maya, our virtual assistant for the sales reps and in recommendation engines in KnowledgeGenie. 2. How is AI and related tech being viewed by the healthcare industry when it comes to facilitating access to services or backend support? Deepak: AI has a huge role to play in managed services and backend support. In fact, well designed AI is an excellent first line of defense especially when it comes to dealing large volumes of service requirements like customers reaching out to a website, or patients looking for services or with a large employee base looking for answers to basic questions. But the adoption of AI in these areas are highly varied across organizations and depends a lot on the scale and the philosophy of the organization. But there is increasingly a trend of higher adoption of AI across the board within the healthcare industry. 3. So, we hear you’ve launched Maya – a virtual assistant for your field force. Tell us more. Deepak: Abbott, in association with SmartBots AI, has successfully launched an innovative new virtual assistant to support and engage their pan-India sales force — and her name is Maya. Maya is a BOT with a personality. Developed by SmartBots AI, and powered by Amazon’s LeX technology, she uses a voice or chat interface to communicate with employees in simple natural language, and provides them the assistance they need–with administrative tasks, answering FAQs, daily operations, receiving reports, or training. She acts as a facilitator, helping employees to tap into an enterprise knowledge base (like SalesForce or Tableau) through familiar, easy-to-use communication channels. 4. Many companies are integrating AI into their business. What makes Maya unique and how will it help Abbott’s field force and HCP’s? Deepak: In early 2018, Abbott became the first pharmaceutical company in India to deploy an AI virtual assistant for its field force. Abbott’s Pharmaceuticals Division initiated a pilot by getting around 3,000 sales employees to start engaging with Maya for their day to day queries. Maya acts as a personal assistant to the employee, providing sales operations support and keeping them ready for the day, providing access to contextual information at their fingertips. She is their virtual assistant while they are in the field meeting doctors. With Maya handling the nitty-gritties of querying and fetching information from enterprise applications, an employee can focus on the crucial aspects of his role and leave the spadework to Maya. The unique differentiator is that Maya gets continuously trained on failed questions and is able to answer such questions going forward, thus making it an intuitive technology. Maya receives an average of 500 queries every month, and she can answer the majority of those questions correctly. With most commercial chatbots, failures are not handled well but with Maya, any unanswered query gets logged as a ticket with our employee helpdesk. Maya gets continuously trained on failed questions and is able to answer such questions going ahead, thus making it an intuitive technology, which is a unique differentiator. 5. What prompted you to look for an AI solution? Deepak: Abbott in India has a large field force with 8,000+ frontline sales colleagues and has a field helpdesk for a decade or so already. Once we took a full year’s worth of field queries and did an indepth data mining exercise and to our surprise found that almost 60% of the questions were repetitive and were related to basic processes and administrative tasks that our reps face everyday (like applying for a salary advance, getting a customer list updated in the CRM and so on). This insight is what prompted us to think that we should try to build a bot/virtual assistant to help our reps with their daily challenges. Unlike the helpdesk which closes operations in the night, a virtual assistant is available 24 X 7 and more suited to the younger generation of reps who are more comfortable texting than calling up a helpdesk or sending email queries. 6. Tell us about the Maya development story - from technology to business solution. Narsimha: Smartbots participated in the discovery effort of Abbott to leverage AI to start solving the routine queries and provide quick resolution to sales teams. That was when Maya was born – a virtual agent which is accessible 24/7 and address Sales force queries instantly. The Virtual Agent solution is based on Amazon Lex and integrated with Salesforce. While Maya started as a chat BOT answering most redundant questions, over a period of time the scope of Maya grew to integration across enterprise systems, self-learning (Machine learning) from the usage of field force and predominantly making access to enterprise information seamless. Maya’s success is attributed to dedicated and proactive involvement of Abbott’s Business effective team which was key for a project of such large scale implementation. Today as we talk, Maya makes it simple for field force to access enterprise systems, bringing in visibility to critical business insights. 7. Have the results so far been encouraging? Deepak: Absolutely. Maya’s results have thus far been pretty encouraging. 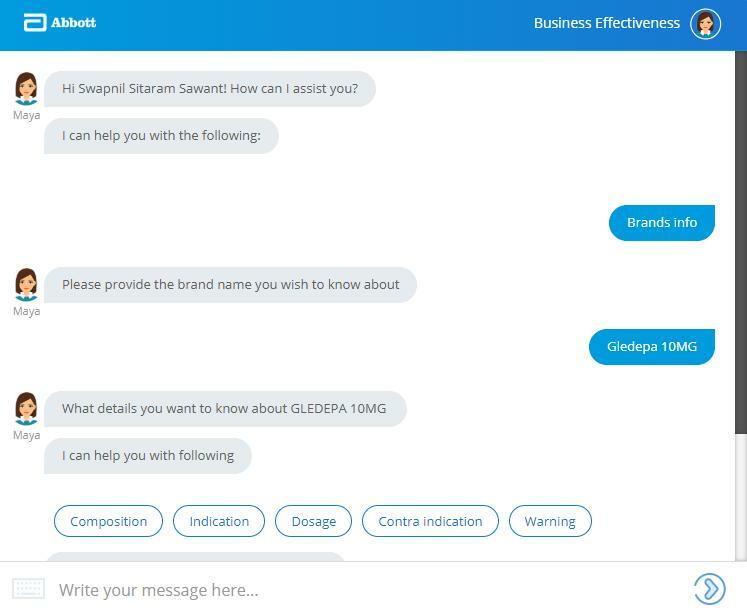 With Maya’s help, Abbott’s medical reps now can access their KPI Parameters on the go by chatting with Maya and also get complete information of all the Brands (including indications, molecule info and side effects) resulting in better in-clinic performance. In today’s fast paced life where pharma sector is evolving dynamically, technology such as Maya helps our sales team 24X7 in managing their work and taking timely decisions. Since launch, Maya has addressed close to 12,000 queries. Today 32% of the monthly queries raised by Abbott reps are being answered by Maya with a 74% success rate. Medical representatives can also check their execution parameters, expense reimbursement status, plan for the day and leave balance on Maya leading to increased satisfaction. 69% of the Field force rate Maya as helpful. 8. How do you plan to scale this technology? Where do you see this going? Deepak: Having tested Maya’s capabilities with the Sales team, Abbott has deployed this virtual assistant to more than 8,000 employees. There are plans to use the SmartBots AI platform to build bots for several other departments like Business Analytics, Supply Operations to name a few. 9. From your experience, what lessons would you share for others who wish to deploy AI to increase effectiveness? Narsimha: AI in essence is nothing but a way to imitate human behavior. Hence the critical ingredient for an AI implementations need scale as the most important aspect is the learning or training of the AI solution that happens after you build the core functionality. Deepak: In order to be successful at scale it is important to seek executive sponsors within the organization who can help you sustain during the initial period of learning when your AI solution is learning from its own mistakes. And finally make sure to design the solution to fail gracefully when it cannot accurately imitate human behavior. Many of the AI failures across industries can be attributed to AI solutions not handling errors gracefully.